We’d love your help. 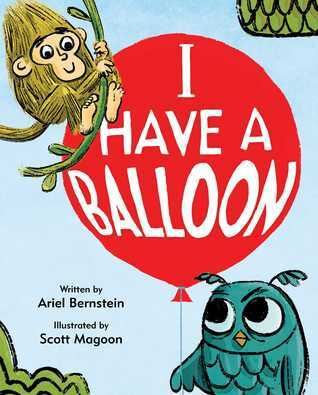 Let us know what’s wrong with this preview of I Have A Balloon by Ariel Bernstein. Monkey desperately wants Owl's balloon and tries everything to get what he wants—this is not a book about sharing. To ask other readers questions about I Have A Balloon, please sign up. This book is like Nutella for me. Everyone loves it except me and I feel like a huge weirdo for not being in love with it. I found it repetitive and boring and hard to read. My son and I both got bored about halfway through. Owl has a big, shiny, red balloon, and Monkey wants it. He's willing to trade for it, and has a lot of suggestions, all of which Owl rejects . . . until . . . Very funny, very colorful, and BAM! - a surprise ending! Reminds me quite a bit of classic Dr. Seuss. This might be my new go-to storytime title. A great book about sharing--and not. The text is fun to read aloud and Magoon's illustrations are bold and bright. Also sure to inspire some fun discussions. Thanks to the Kid Lit Exchange for the review copy of this books. As always, all opinions are my own. Owl has a red balloon. Monkey wants it. Only one goofball animal can win. The book summary reads, "Spoiler alert: This is not a book about sharing." I received this new picture book on Friday and it immediately went missing. Not long after, I found my 6-year-old curled up behind the couch reading it aloud to herself. The book uses repetitive phrases that makes this book funny and perfect for new r Thanks to the Kid Lit Exchange for the review copy of this books. As always, all opinions are my own. I received this new picture book on Friday and it immediately went missing. Not long after, I found my 6-year-old curled up behind the couch reading it aloud to herself. The book uses repetitive phrases that makes this book funny and perfect for new readers. And although it may not be about sharing well, it's definitely a hilarious lesson in how NOT to share with your friends. Owl has a balloon, and Monkey wants it. Monkeys tried to get Owl to trade, but Owl isn't interested in anything Monkey offers for trade. A cute and funny book about not sharing. Loved the ending. Owl has a shiny red balloon. Monkey never knew just how much he wanted a shiny red balloon. He is willing to trade just about anything for that balloon. Except maybe a sock. Parents will recognize some familiar "not sharing" behaviors, and kids will relish the surprise twist at the end. With it's quick, witty dialogue and hilarious illustrations, this picture book is likely to become a read-aloud favorite in your house. It certainly has in mine! Readers with small children will wryly recognize their little ones in Owl and Monkey's antics. Bernstein's text is pitch perfect, and along with Scott Magoon's bright and graphic illustrations, they capture the fickle desires of kiddos everywhere.Young readers will find it hilarious and want to read it again and again--witty and clever, their adults will happily oblige. A super fun and funny book about an owl and a monkey trying to negotiate a trade between a red balloon and a sock with a star and a perfectly shaped hole. The deadpan deliveries and wacky illustrations make this a great read aloud book. I want to give this book more than 5 stars! Simple, clever, funny, engaging! Perfect tale (not about sharing of course) of I see what you have, and now I want it. LOVE the language! Kids will enjoy this as much as I do! Owl has a balloon. Monkey wants a balloon, and offers to trade an increasingly hilarious series of items, without success. Sweet and funny and perfect for fans of Elephant and Piggie! Such an excellent book about being happy with what you have. Perfect for the child learning to share and the adult struggling with fear of missing out on Facebook! Owl has a balloon. Monkey really wants the ballon, talking first about how wonderful the balloon is, then offering all sorts of stuff to trade Owl for the balloon. A sock catches Owl's eye just as Monkey is about to accept defeat. Owl grows excited about the potential of having a sock and tells Monley all the wonderful things that can be done with a sock. It is enough to make Monkey want to keep the sock. Both animals are now happy with what they have. The last page shows a lemur holding an ice Owl has a balloon. Monkey really wants the ballon, talking first about how wonderful the balloon is, then offering all sorts of stuff to trade Owl for the balloon. A sock catches Owl's eye just as Monkey is about to accept defeat. Owl grows excited about the potential of having a sock and tells Monley all the wonderful things that can be done with a sock. It is enough to make Monkey want to keep the sock. Both animals are now happy with what they have. The last page shows a lemur holding an ice cream. We can assume not Owl and Monkey will desire the ice cream and the cycle will continue. Kids and their stuff. Littles can become ardently passionate about the oddest possessions, particularly when said items are desired by a member of the competition. Bernstein nails this dynamic perfectly in her dialogue-driven story. Magoon enhances the hilarity with quirked eyebrows, defeated slouches, and exasperated frowns exchanged between the main characters, Owl and Monkey. Packed with funny, charming and oh-so-insightful truths for parents and young readers alike, I HAVE A BALLOON is a lighthearted look at the process of negotiation when sharing becomes paramount. "That is a big balloon." The reader soon finds out that Monkey wants that balloon but nothing he does can convince Owl to give it up. That is until Monkey offers a holey, starred sock that finally convinces Owl to trade. But now that Monkey's sock holds value, he's not likely to give it up. This debut picture books is silly, fun & can lead to important conversations! I Have A Balloon is about a monkey who wants Owl’s red balloon. He tries to trade many things. And one sock with a star and a hole gets owl finally thinking about the trade.... you need to read the book to really appreciate the humor Ariel has written. @skortch’s illustrations do a great job supporting the text and add even more depth to the story! . This book can be used for all age kids, as it touches upon a theme This debut picture books is silly, fun & can lead to important conversations! This book can be used for all age kids, as it touches upon a theme of needs versus wants and also sharing! This is her first book and she has a chapter book series, Warren and Dragon, to be released in August. We can’t wait to get our hands on them! Sometimes, you read a book and it evokes a familiar song lyric... This time, it was Paul Simon's classic "Negotiations and Love Songs." Owl and Monkey are easily recognizable to parents and kids of most of the parents and kids (or other adults) they know. This book also capitalizes on our fetishization of "the Sometimes, you read a book and it evokes a familiar song lyric... This time, it was Paul Simon's classic "Negotiations and Love Songs." This book also capitalizes on our fetishization of "the new hotness," as is demonstrated in the last poignant wordless spread. Funny and re-readable... "I Have a Balloon" is a great addition to any picture book collection! I personally think this book is a hoot. For me, it has a similar vibe to the Jon Klassen hat books. I can imagine there will be children who won't get it and even be offended by it, but others will understand the nugget of truth embedded in the story. I love Scott Magoon's art, as usual, and think the text/art pairing is perfect. I look forward to reading I HAVE A BALLOON to my 14 year old son (a rule follower with very discerning taste in picture books) to see what he thinks. I read this book to my preschoolers this week, and it is fun, funny, and engaging. One of my favorite things about it is that it is one of those books that allows the reader/listener to continue the story after the pages close, so we got to have a nice conversation about how some stories continue after we finish reading. Then, the students were able to make their predictions and guesses, and they felt joyful about being storymakers themselves. This book subtly presents the idea of sharing and satisfaction with what you have WITHOUT being pedantic or preachy. The illustrations are lively and engaging and the text is humorous. The author also perfectly hits a reading level that are perfect for children ready to launch from co-reading to solo reading. After one read through my twin six-year olds were independently picking out words and reading back and forth to each other. Magic! Love it! This review has been hidden because it contains spoilers. To view it, click here. You shouldn't covet what other people have. You should be content with what you have. If you have a shiny, red balloon, you should enjoy your shiny, red balloon. If you have a sock with a star and a perfectly shaped hole, you should be content with your sock with a star and a perfectly shaped hole. UNLESS SOMEONE HAS AN ICE CREAM CONE, THEN YOU SHOULD GIVE UP ALL YOUR WORLDLY POSSESSIONS FOR THAT ICE CREAM CONE! I love picture books that bring us together with our young readers. I HAVE A BALLOON is a fun and visually charming book that lends itself to a lot of interaction with the reader. What do they think about the balloon? Should owl make a trade? Did Monkey make the right choice? What would you do with a balloon or a sock? These are really interesting and relevant things to kids! It's a story about play and sharing (or not) and most importantly, the act of play through imagination. Love the book jacket spoiler alert that this is not a book about sharing. Monkey really wants Owl's red balloon since - now. He tries to trade a variety of items for it and Owl says no each time. Finally, Monkey offers a special sock. Owl talks about all the things he could do with the sock and agrees to trade. Monkey changes his mind since he's wanted this special sock since - now. Cute twist at the end when a third character arrives. This book is about a bird and a monkey who are trying to trade different objects between the two of them. This book would be very good for students who are working on a very short list of new vocabulary. There are lots of cases of repetition throughout the book. The pictures are also very cute, and students would like seeing the animals play together. This clever picture book, which is in no possible way about sharing (at least that’s what the spoiler says-wink) is a wonderful springboard for conversations about jealousy, sharing, and stepping into another person’s (or owl’s) (or money’s) shoes (or holey socks as the case may be.) Perfect balance of humor and lesson. My kids and I thoroughly enjoyed this book. Even my 8 year old enjoyed looking on as I read to my 6 year old and we laughed out loud. This book comically captures the concept, that you always want what you don't have. The illustrations are fun and the text is funny. Highly recommend for reading time for 4 through 6 year olds. Ariel Bernstein is a picture book, chapter book, and short story writer. Sometimes she also writes out grocery lists as long as they include the word marshmallows. She lives in New Jersey with her family.